If you live in the southern or eastern United States, take a moment to imagine the forest nearest you. Fill in, among the oaks, hickorys, and pines, just one tree: the American chestnut, with it’s slender saw-toothed leaves and long, yellow catkins. It’s a staggering image. Scientists estimate that as recently as a century ago, one in four trees in eastern deciduous forests was an American chestnut (scientific name castanea dentata). But now, the tall, old-growth American chestnuts that once dominated the forests exist as little more than a scraggly shrub, if they are to be found at all. Sadly, this ecological misfortune is not just isolated to that patch of deciduous forest along the Tennessee-North Carolina Border. I didn’t know about the plight of the American chestnut when I first visited the Max Patch Backcross Orchard. The orchard is a direct-seed test site nestled in the rolling hills of the Pisgah National Forest. I might have never known about the efforts to revive the lost American chestnut had my fiancé, Chelsea, not gone to plant American chestnut saplings with her dendrology class at the University of Tennessee at Chattanooga. As an English graduate student, the narrative scientists fighting to revive a lost tree was a distant one reserved for compelling pieces published in NPR. But on that warm, July day, I was a small part of that narrative. As we drove through the national forest I pictured what it would look like full of chestnut trees; I was about to see nearly one hundred and fifty. By some accounts, there were once about twenty genetically diverse types of American chestnut in the south, according to Dr. Hill Craddock of the University of Tennessee at Chattanooga. Craddock attributes this, in part, to the South’s hospitality towards organic life during periods of glacial maxima. When vast sheets of ice covered the earth, organic life either died off or moved south. The south offered organic life, the American chestnut included, what’s known to biologists as ice age refugia–tiny geographical pockets conducive to life during periods of otherwise inhospitable climate conditions. In the case of the American chestnut, the trees bred among themselves in these refugia until the ice sheet melted, at which point they were able to spread, to rejoin and breed with other pockets of trees. Because of this, Craddock says, “it may be that chestnut trees are adapted to the local soils and climates [of the American south], as well as variations in those soils, climates, and pests.” If Craddock is correct, and the refugia helped preserve the American chestnut, the process also created a trove of biological diversity. Within the native range of the American chestnut, genetic diversity among the trees and symbiotic relationships with wildlife and flora flourished. Further, the bulk of the tree’s range was rural and mountainous, and so the American chestnut not only offered important biological contributions to the surrounding forests, but economic and cultural stability, as well. As we nosed our car through the slot left open by a steel gate guarding the Max Patch Backcross Orchard, I knew I was witnessing something spectacular. I’d never before seen an American chestnut, and yet, here they were: hundreds of them planted in tidy rows along a gently sloping hillside. The Great Smoky Mountains loomed large in the distance, to the south. At full maturity, an American chestnut towers above the forest floor, reaching nearly one hundred feet in height; its trunk can expand to nearly five feet in diameter. The saplings at the Max Patch Backcross Orchard were hardly seven feet tall. Even the smallest hand could easily wrap around their stems. As we walked through tidy rows of chestnut saplings, I asked Chelsea about the fate of these trees. Would this orchard serve as a sanctuary for the trees? Would Craddock and his students come back, year after year, to mark the growth of each tree? “These are test trees,” Chelsea tells me, pinching a leaf between her index finger and thumb. “When they are a little older, they’ll be intentionally inoculated with blight. The survivors will be backcrossed with other blight resistant plants and then the whole process will start over.” The idea is quite poetic: some trees must die for the greater cause of saving the species. John Webb and Lori Kincaid own the Max Patch orchard property. They donated a part of their pastoral land to contribute to the revival of the American chestnut, to science. Their generosity also offered a touch of magic. In a far corner of their land stands a mature, native chestnut tree. And it still–mysteriously–flowers. After we’d seen the orchard, we drove to their house, a few hundred feet away. Almost as soon as we arrived, at John and Lori’s insistence, Chelsea and I found ourselves trudging up the hill at the far end of their property. We passed rows of wildflowers and a grist of bees, hard at work, to see the magic, flowering chestnut. I would have walked right past it had Chelsea not stopped me. I had only that day seen my first chestnut tree, and I was certainly no expert in identifying them. I turned and was again presented with a new sight: my second American chestnut tree. A cluster of thin, yellow chestnut catkins, a little less than a foot long, dangled a few feet above my head. Rural Appalachian communities relied on the resources provided by the American chestnut. Near Newport, Tennessee, before the the railroad came to the area in the 1880s and while the forests were still teeming with the American chestnut, “free-ranging hogs, turkeys and cattle would fatten on chestnuts in the fall before being driven, on foot, along the French Broad River,” says John Webb. John and his wife, Lori are deeply rooted in the narratives of the local community. They are deeply invested in the fate of the American chestnut. John wrote me to explain a little about the importance of the American Chestnut in his area: “The timber from the American chestnut was easy to saw or split and was durable, and many local structures and split-rail fences were made of chestnut and much lumber was sawn for distant markets. Newport, Tennessee was also the site of a of a large tannery, and chestnut, loaded with tannic acid, yielded wood ideal for tanning animal hides.” Even now, locals can still find sound American chestnut logs cut down during the rapid spread of blight, half-buried in the forest floor. If the American chestnut was once considered an economic and ecological panacea in it’s Appalachian range, by 1904 that had all changed. The botanist Donald Culross Peattie wrote this about the American chestnut: “All words about the American chestnut are not but an elegy for it.” Cryphonectria parasitica–commonly called chestnut blight– is a foreign fungal pathogen that slashed its way through the extant American chestnut population of the southeastern U.S. The signs of blight are ominous, and its impact vicious: orange cankers form on the bark of infected trees, and within a short period of time, the once-towering chestnut, unable to slough off the fungus, withers from the canopy. Blight dealt such a heavy blow to the American chestnut, so quickly, that many scientists, including Peattie, lamented the loss of the once-prominent hardwood before it was completely reduced to its current, sparse state. In the century that’s passed since Peattie’s mournful entry, the pendulum has begun to swing from pessimism, towards optimism. Today, scientists, along with volunteers, universities, and organizations such as The American Chestnut Foundation are diligently working to restore the American chestnut to its native range. Orchards such as the one near Max Patch are scattered across the eastern U.S. and are a major part of the revitalization process. Most of them are branches of The American Chestnut Foundation, an organization that is dedicated to developing a blight-resistant American chestnut. At these test orchards, those involved with the restoration of the American chestnut are presented with a haven in which to experiment. The idea is to advance the hybrid trees from one generation to the next, selecting for American characteristics. The result is a tree that carries the physical characteristics of the American chestnut, yet are blight resistant. The trees at a test orchard are specific to that region. “We setup this program thirty years ago in chapters where each state will be breeding for local adaptation,” says Craddock. “The idea is that, in Maine they’re breeding for Maine chestnuts; in Pennsylvania they’re breeding for Pennsylvania chestnuts; in Tennessee, we’re breeding for Tennessee chestnuts.” This approach retains a high level of genetic diversity among the trees. Craddock, among others, fears a reality in which there is only one type of American chestnut in the South. He much prefers to imagine a future in which there are numerous varieties. About two hundred and fifteen new chestnuts have been planted at the Max Patch orchard since the original trees. While these new trees are also backcrossed, they differ slightly from the others: they have as their mother a specific tree from the property they are planted on. The presence of a native chestnut at the Max Patch test orchard is remarkable. More mystical is the fact that the tree is infected with the chestnut blight and still flowers. John tells the story like this: while out walking one summer, about ten years ago, he discovered what he thought was an American chestnut in bloom hanging over the fence between his property and the neighbors'. Amazed, and in disbelief, he rushed back to tell Lori. Delighted as they were, the two weren’t sure it was a native tree. To make sure, Lori, who had recently met some folks affiliated with TACF, reached out to Ross and Elberta Broadway of Ten Mile, Tennessee. They, along volunteers from with the Tennessee chapter of TACF, offered to come look at the tree and positively identified it as an American chestnut. Upon discovering that this magic tree was, in fact, a native, mature American Chestnut, the tree’s location was reported to Craddock. Along with his wife, son and a group of students, Craddock came to John and Lori’s property and began propagation of the tree. “I’ll drive 200 miles to go see a blooming chestnut tree,” Craddock tells me as we sip beer in a local brewery in Chattanooga, Tennessee. Craddock, donning wire-rimmed glasses and a fleece vest with the American Chestnut Foundation logo embroidered on the chest, tells me of the tree on John and Lori’s property. I ask him what, besides the fact that the tree near Max Patch flowers, makes it so unique? His eyes light up behind his glasses. “Something magical,” he says, sipping his beer. American chestnuts vary in their susceptibility to various diseases, including blight. Craddock has discovered that, while the the tree at John and Lori’s is infected with blight, it possesses a different, hypovirulent strain of the fungus that allows it to continue to flower. The discovery is a breakthrough. “The virus keeps the fungus from killing the tree,” he continues. “It’s a naked, double-stranded RNA. So, it doesn’t have a protein coat and it doesn’t spread through the air. Fungi, when they grow, fuse their bodies together, so it’s transmitted cytoplasmically.” This sounds like great news for the revitalization and future survival of the American chestnut. But because the magic Max Patch tree is isolated it can’t produce chestnuts. A recent development in chestnut research has added somewhat of a curveball to the conversation. Genetically engineered American chestnuts, modified with a wheat gene that combats the blight fungus by producing oxalate oxidase, has come on the scene. The modified gene effectively disarms the blight, rendering it useless and allowing the tree to continue to grow and flower. The enemy of my enemy is my friend. Craddock explains that, while there are obvious benefits, such as blight-resistant trees–what traditional and nontraditional plant breeders alike have been working towards for nearly one hundred years–there are some downsides. Craddock invited me to stop by his greenhouse the following Thursday to see how everything works on the back-end of the hybridization process. “There’s some Carolina Wrens that have made a nest in that cardboard box, over there,” Craddock says to me, as he plants seeds from a chinese cultivar of chestnut into small, plastic containers. Craddock’s greenhouse is divided into three sections. Each table is lined with chestnut trees at various stages of maturation. The youngest are just seedlings. Craddock makes it a point to tell me that seeds are still trees. More interesting, perhaps, is the layout of the greenhouse. To the left are all the trees set aside for conservation purposes: these trees are traditionally backcrossed, local Tennessee adaptations of American chestnuts, like some of the trees planted at Max Patch Orchard. The middle rows are dedicated to genetic experimentation; here is where Craddock and his graduate students get to attempt long-shot projects. On the far right side, near where the Carolina Wrens made their nest, is a section dedicated to application. Here is where projects, like one in which a graduate student traveled to Alabama to propagate a native tree, live. The American Chestnut Foundation has five and ten year strategic plans. It also has twenty-five, fifty, and one hundred year strategic plans. “When we look at the forest one hundred years from now, the trees at max patch might be one hundred years old,” says Craddock. “They could be big and producing. But it’s not a chestnut forest. It’s one orchard. To restore a chestnut forest is going to take many centuries. A lot longer than it took to destroy it.” I’ve seen one orchard and a greenhouse filled with chestnuts. Even if Craddock’s outlook is modestly optimistic, it’s the tenacity he and those like him share that give me hope. It might not be a drop in the bucket yet, but it’s a step in the right direction. 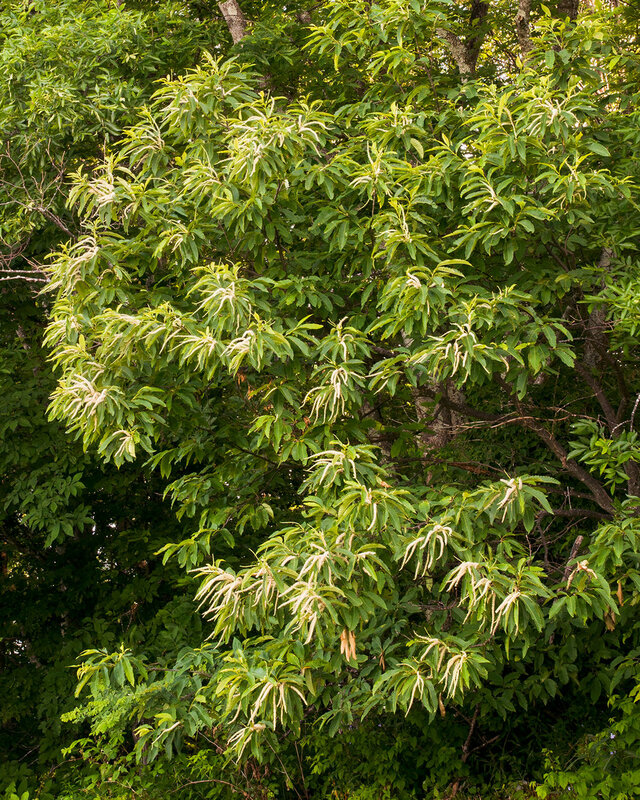 Without intervention, the American chestnut might become extinct. Hope for the return of the American chestnut lies with the people working hard to save it, with the people willing to donate their land, and with a little magic. Drake Farmer was born and raised among the hills of Eastern Tennessee. He earned a MA in English from the University of Tennessee at Chattanooga. He has written for TREND, a monthly magazine from the Chattanooga Chamber of Commerce. If he isn’t out walking and looking for birds, he can be found reading the words of others or writing some of his own.